This was what I thought when I left Tabin Wildlife Reserve last week. Don’t get me wrong. I am not going back there to kill animal and shoot wildlife. I want to kill more time and shoot more photos. If you love nature, Tabin will be like a treasure hunt to you. There is always a new pleasure surprise waiting for you in next minute, and you will want more. Besides Danum Valley, Tabin Wildlife Reserve is another best wildlife watching spot. It is just 44 KM away from Lahad Datu. The transport will take 1 hour 30 minutes. 10 minutes on the usual road, then 1 hour 20 minutes on gravel road. You will see ocean of oil palm plantation on the way. No, there is no bus going there. 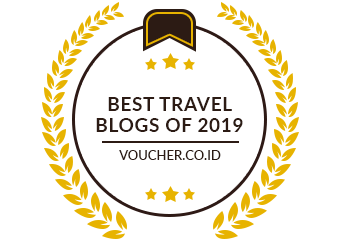 Taxi will ask for RM250, gila… You already can book the Tabin tour, which costs less than RM200 (USD50) and 2-way transport is included. 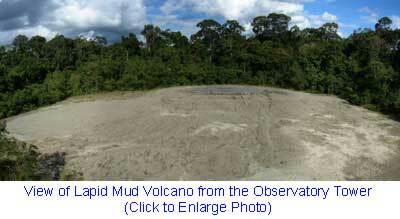 Our first activity is to go to the Lapid Mud Volcano. It is as big as a football field. According to the guide, the mud volcano is still active in producing mud, and it becomes higher and higher due to the accumulated mud. They say the mud contains a lot of minerals and it is good for your skin if you apply it. Even the elephants and wild boar know its value and come to eat the mud. 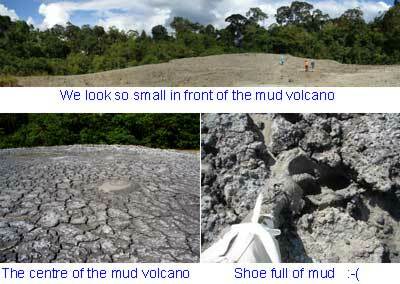 After 30 minutes of jungle trekking (700 Meters trail), we saw the mud volcano. 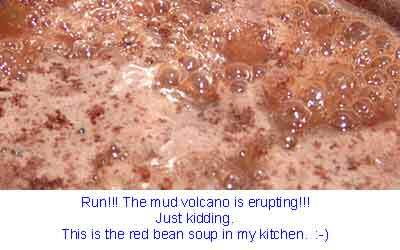 I was so excited and walked quickly to the centre of the mud volcano. Then “pop!”, one of my feet was trapped in the mud. Man… the suction was so strong that it took a lot of strength to pull out my foot. Actually it is very dangerous to run to the centre. The mud on the thin surface is dry and looks hard, but underneath is a pool of deep soft mud. I heard that there was a girl got half of her body sank into the mud. She was so scared and cried for help. Two guys finally got her out of the mud, but her pant was left in the mud. So be careful.. BTW, you really need a spare shoe for the jungle trekking, as the trail is very wet and muddy. Of course, Tabin is never lack of wild animals. I have taken some photos during the jungle trekking, and share them in photo gallery here. The resort itself is already in the forest so you can see and hear the wildlife too. Unfortunately, many of them flee before I take out the camera. All 8 species of hornbills can be spot here. Too bad I didn’t see any Pygmy elephants. We also had a night safari at 9 PM. We found deer, slow loris, fire fly… It should be more animal if it was not raining that night. This is not a zoo so you will need a bit of luck. Anyway, this was the first time I explored forest in the dark. Still an interesting experience. I should have stayed long enough.